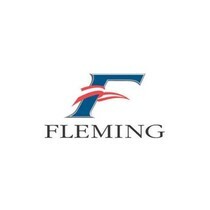 The Fleming shipyard was established in 1985 under the careful surveillance of Tony Fleming. Subsequent to their foundation, Tony Fleming embarked on a series of adventures to take his line of yachts to the pinnacle of the marine industry. They continued to grow and have become more attractive and trendy. Claiming that their vessels have great design is a vast understatement. Their engineering is phenomenal. 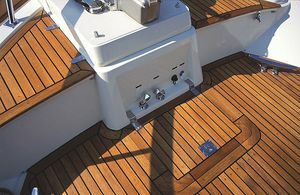 Perfection reflects on their non-flex hull made of fiberglass and strengthened with the interlocking matrix of frames. Secondly, their crafts are manufactured with a full-length keel extending underneath the propellers and the rudders. 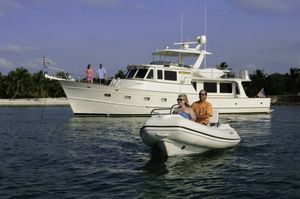 The rides on a Fleming yacht is whisper quiet and tranquil due to a miscellaneous system eliminating the sounds of the engines. 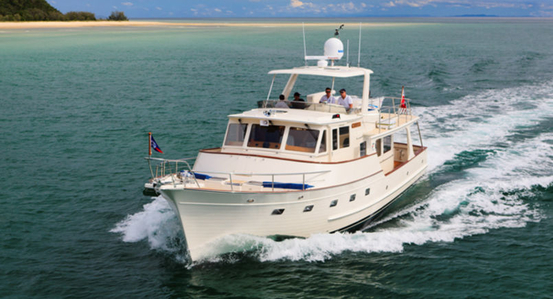 Indeed, Fleming Yachts are the ultimate cruising vessels and one of those magnificent vessels is their 55 model. She is a raised pilothouse vessel intended for genuine cruising. The semi-displacement hull provides the best of both worlds since she possesses marvelous attributes from both displacement and planing hulls resulting in great performance and amazing flexibility. Let’s evaluate the Fleming 55 review. The Fleming 55's overall length is 55 feet and 9 inches and has a beam of 16 feet. Starting from her performance, she is driven by 2 x 500 horsepower Cummins QSC 8.3 engines. 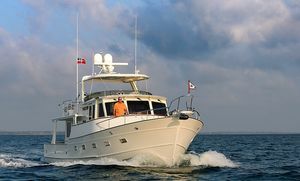 She can comfortably cruise at the speed of around 15 or 16 knots, nevertheless, most owners cruise at 10 knots with a fuel consumption of around 11 or 12 gallons per hour. 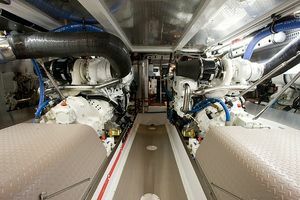 At 8 knots, her fuel consumption is about 4.5 gallons per hour. This beauty can reach a top speed of up to 18 knots and can range 2000 nautical miles with 8 knots. All in all, the Fleming 55 can cruise agreeably from 8 to 17 knots due to her sharp entry, hard chines aft, steady deadrise, and of course, semi-displacement hull. Knowing they have a champion, Fleming did not change their basic hull design. 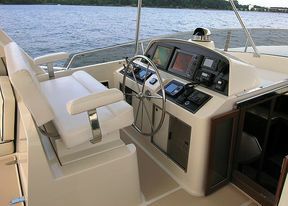 The Fleming 55 has two helm stations. The second one is placed in the open flybridge to port. The seat is big enough for both a pilot and co-pilot with stainless steel footrests. 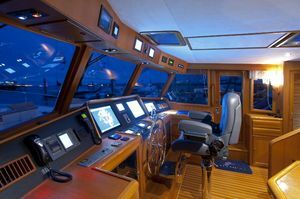 The helm consists of a huge stainless steel steering wheel, bow thruster, and stern thruster joysticks to port, twin electronic controllers, SmartCraft, monitoring system on both engines and Raymarine E14W display. Further, it’s got a Ritchie compass with light, dimmer and rudder angle indicator also with light & dimmer. The flybridge lounge is quite spacious and it’s great for having fun with your friends and family on a sunny day. Two settees occupy both port and starboard side. The settees contain EZ-dry foam with Sunbrella upholstery and mesh backs for drainage. The table includes three fixed cup holders. Basically, this is a splendid area while cruising around. The pilothouse is a great place to be when the wind is blowing strongly. It’s a proper driving place with a centrally positioned helm and a skipper’s chair. The chair can swivel. It is adjustable and has a footrest. The helm possesses almost the same gadgets like the flybridge helm like SmartCraft, navigation systems, wide Raymarine screen etc. Additionally, the helm comprises ABT track digital stabilizer system which is a part of the secret of the excellent ride of this boat, AIS, wind indicators, TV cameras, chart plotters and infrared. The Fleming Company designed their own central monitoring system. The system encompasses the monitoring of the tank levels, bilge water, engine room temperature, navigational lights etc. The Fleming 55 helm is loaded to the gills. Behind the helm, there is an L-shaped settee with hi-lo wooden table to port. 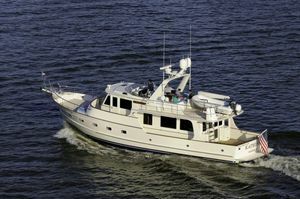 The pilothouse is really dedicated and functional which adds attractiveness to the Fleming 55's price. The galley and the saloon are on the main deck abaft the pilothouse. The galley has been tuned up and it reaches the perfection of practicality and luxury at the same time. The U-shaped galley accommodates a beautiful broad composite double sink embellishing the galley with its elegance while the practicality of the “Insinkerator” garbage disposer adds another practical nuance to it. The buyer has two options for the countertops. One is granite and the other one is Corian and back splashes. The galley also welcomes a conventional microwave with cooktop overboard vent. Cooking assignments are eased up with a three-burner ceramic electric stove and sea rails. This galley contains a slide-out pantry locker with three shelves. To port is full-sized fridge/freezer which includes two vertical doors. Last, but certainly not least, is the dumbwaiter from the galley to the flybridge. It’s a small elevator that can carry things from the galley to flybridge, which is an outstanding instrument. The galley of the Fleming 55 is simply lavishing and delights passengers on the boat. The saloon is overflowed with a home atmosphere, serenity, and teak. An upholstered L-shaped settee is situated to port with a hi-low oval table with a teak top. The table can be implemented for cocktail parties or meals. Opposite the settee are two wooden comfy chairs. 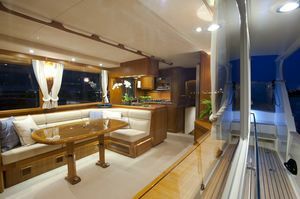 The saloon is bathed with natural light via immense windows on both sides and sliding door at aft end. 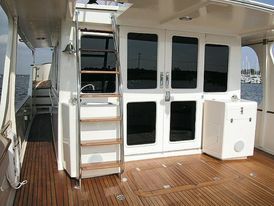 The sliding door is made of fiberglass and has “seadog-style” latches. Surely, the air-conditioning can always give a hand during the hot days. The cockpit is enormous with 130 sq. meters marking it as one of the biggest in the class. 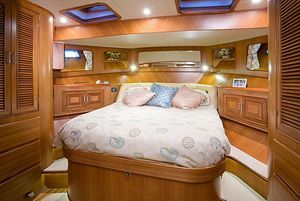 The cockpit is furnished with a cold and hot shower, just like the foredeck. Going below deck, one discovers many splendid amenities of the Fleming 55. Starting from the most forward point of the boat, the master stateroom is simply done to perfection. A tapered queen-sized bed with hydraulic lift, manual slide mechanism, and foam mattress occupies the center. As mentioned, the bed can be raised electrically with a press of a button. The book lovers do not have to worry since there are berth reading lights. The light is also underneath the bed, but in this case, it’s LED lighting. The natural light comes into the area through portlights. Furthermore, the room comprises TV space on the bulkhead, two hanging lockers, some drawers, beveled-edge mirrors, CO detector, and drapes. The en-suite master head is pretty stylish and elegant. This en-suite contains a marble countertop that matches with a marble sole in the shower. The head contains standard features such as faucet, beveled-edge mirror, ventilator fan, LED overhead lighting, faucet, glass custom shower door and so forth. 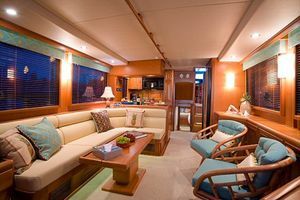 Moving to the guest cabins, the Fleming 55 has two cabins. 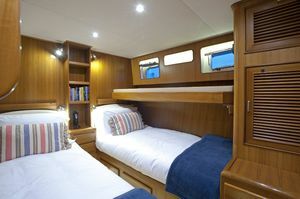 The port guest cabin accommodates twin berths, louvered doors, drawers, wooden bulkheads and bookshelves. Alternatively, instead of twin berths, one can choose a double bed. The starboard guest cabin with bunk beds and nightstand with drawers can be converted into the office according to different needs of the owner. Both guest cabins have the same lighting and standard features like the master stateroom. The guest head has teak cabinets, a shower stall and basic features like the master head. The Fleming 55 has established herself as one of the exquisite semi-displacement cruising yachts in the world. Her exterior demeanor seizes a classic motif which is elegant and classical at the same time. The Fleming 55 layout corresponds to the sole perfection of the design and engineering. With new ideas, the yacht has been evolving for years and now stands tall among her peers with her functionality and appearance. She even obtained CE Classification "A" standard. Capture the moment and grasp the opportunity. Contact us now and get onboard this beauty and breath the ocean air in! Get your own Fleming 55.